It seems a fair rule: artists should never respond to criticism of their work. But few artists are able to resist the temptation, and the outsized role that critics play in an artist’s success, especially in more rarified fields, makes it almost inevitable that the result will be rancorous. The critic has the privilege of print and access to a large readership. How can the artist hope to respond to opinions with which they disagree, especially when these opinions seem to present an existential threat to their reputation and livelihood? In the case of Ian Hamilton Finlay, famous concrete poet and landscape architect—whose work I had the pleasure of archiving recently, through a collection donated to the Kislak Center by Graeme Moore, a landscape artist and Finlay’s longtime associate—the answer was a form of ideological warfare. In 1986, two architecture critics, Gwyn Headley and Wim Muelenkamp, under the auspices of the UK’s National Trust, published Follies, a guide to what they saw as eccentric buildings and gardens throughout the United Kingdom. The authors included Finlay’s Little Sparta, a garden full of sculpture and concrete poetry, in this volume. Perhaps they meant this as a harmless designation, or even a way to drum up interest in what they saw as an unfairly neglected site. As the production of printed matter grows increasingly automated (not to mention digitized), the handwriting of the past feels more precious with each passing year. One of the great pleasures of working in an archival repository is appreciating the wild variety of human penmanship, from chicken-scratch capitals to the ornate, formal calligraphy of diplomatic documents. “He writes a fine hand” is no longer a well-understood saying, and yet I miss the physicality of the phrase: the sense of the appendage merging with the text it produces. I was reminded recently of how fine handwriting can turn a written document into an object of beauty as I processed a collection of scores by Robert Capanna. Capanna was a Philadelphia composer and longtime Executive Director of the Settlement School, a community arts school with campuses across the greater Philadelphia area. The scores range from the early 1970s to 2016, a span that showcases interesting changes in the way music was drafted and reproduced. For the first few decades of Capanna’s career, he drafted his scores in pen and pencil on onion-skin, sending the finished versions off to the Theodore Presser Company for engraving and printing. You can see this process in Capanna’s score for “Day,” a long work for voices and chamber orchestra which he revised continually over more than ten years; the initial onion-skin draft, which Capanna’s precise penmanship, transformed into a readable (if more pedestrian-looking) printed score. I cataloged a manuscript which contained three parts, each relating to another. It covers the practical aspects of ritual law, roughly based on the order and topics of Shulḥan ‘arukh Yoreh de’ah, or the code of Jewish law’s section for ritual and dietary law. A word about the provenance: the manuscript is without a mention of a scribe and originally appeared to have been missing place of writing; all that was apparent was that it was from Italy, because of the Italian captions and the script style. However, there was a passing mention of a conversation the unknown author had with Yeḥi’el Treves, naming him as a local rabbinical figure in Vercelli. Vercelli is a city in the Piedmont, which is in the northwest of Italy. It has a history of Jewish communal life. The Great Synagogue of Vercelli, built 1878. Credit: Jewish Virtual Library. Original binding. Appears to be created for daily use. The three parts go as follows: The first part is the work Yemin Yisra’el by Yisra’el Malvano, both a practical and dissertation-style work on Hilkhot sheḥiṭah, or the laws of ritual slaughter; this is a work which survives in numerous manuscripts today. Following is a dissertation on Hilkhot ṭerefot (The laws of unfit meats) in which the unidentified author uses illustrations, descriptions, and definitions to Italian to illustrate the laws of defects which render an animal unkosher. Since the inspection for Terefot involves analysis of the anatomical details of the animal, the author created a manual for the slaughterer to study and to teach with. The third work is an abridgment of the text of the Shulḥan ‘arukh Yoreh de’ah, with other information supplied occasionally. refot involves analysis of the anatomical details of the animal, the author created a manual for the slaughterer to study and to teach with. The third work is an abridgment of the text of the Shulḥan ‘arukh Yoreh de’ah, with other information supplied occasionally. The first illustration in the anatomical text: heads of kosher animals. Above is an example of an illustration in this manuscript; it shows the heads of kosher species of animals. The heading reads ha-Rosh, (the Head); while showing five illustrations of animal heads; Rosh shor (ox’s head, in the center), Rosh gedi (goat’s head, at the corner), Rosh paṿas (with a gander depicted, and perhaps meaning ברוז, barṿaz; lower right), Rosh tarnegol (chicken’s head; upper left) and Rosh aṿaz (duck’s head; lower left). Below is another depiction in the manuscript; this is a combination of parts delineated in the Mishnah (Hulin 3:1). The author of the manuscript drew the “Keres, beit ha-kosot, meses, ḳevah ve-daḳim” (stomach, recticulum, omasum, abomasum, small bowels); each part is numbered, with the illustration mentioning the author seeing examples such as this one. Five parts of the abdomen, numbered. ha-Rosh, (the Head); five illustrations of animal heads, Rosh shor (ox’s head, in the center), Rosh gedi (goat’s head, at the corner), Rosh paṿas (with a gander depicted, and perhaps meaning ברוז, barṿaz), Rosh tarnegol (chicken’s head) and Rosh aṿaz (ducks head), (f. 36r); ha-Moaḥ – Cerebro (the brain, f. 38r); Ḥuṭ ha-shidrah – Il midolo della spina dorsale (the spinal cord, f. 39v); ha-Leḥayayim – Mascelle (the jaws, f. 42r); ha-Lashon – Lingua (the tongue, f. 42v with double illustrations); ʹEtsem ha-mafreḳet – Osso o vertebre del collo (neck vertebrae, f. 43r); Esofago (the esophagus, f. 43v); ha-Ḳaneh o ha-gargeret – La trachea o dura arteria (the trachea, f. 47r); ha-Reʹah – Polmoni (the lungs, f. 49r); ha-Lev – Il cuore (the heart, f. 63v); ha-Kaved – Il fegato (the liver, f. 65r); ha-Marah – Il fiele (the gall, f. 68r); ha-Ṭeḥol – La milza (the spleen, f. 71r); ha-Kelayot – Reni o rognoni (kidney or kidneys, f. 73r); ha-Em ve-shalpuḥit shel me raglayim – Matrice ossia utero e la urinaria (the matrice, namely the uterus and the bladder, f. 75v); Keres, bet ha-kosot, meses, ḳevah ṿe-daḳim (stomach, recticulum, omasum, abomasum, small bowels, f. 75v); ha-Ḳurḳevan – Il ventricolo, ossia magone (the gizzard, or ventriculous; ‘magone’ is a term specific to Milanese; f. 82r); Bene ha-meʹayim o ha-daḳim – Viscero o intestini (f. 84r); Yede ha-behemah ṿeha-agapayim shel ʹof – Zampe / Ale (the paws of an animal, the wings of a bird, f. 95r); ha-Tselaʹot ṿe-ḥuliyot ha-shidrah – Coste o vertebre della schiena (the ribs or vertebrae of the back, f. 97v); ha-Regel u-pirḳaṿ – Il piedi (the legs and feet, f. 100v). CAJS Rar Ms 481, Ḳunṭres Imre emet with Ṿikuaḥ ‘al ha-R.M. di Lonzano, was recently acquired at auction, thanks to the support of the Elis and Ruth Douer Endowed Fund for Judaica Collections. I cataloged a manuscript fragment (or, what originally appeared to be a fragment) of a polemical nature, dated to the first decade in the 17th century in Egypt. The manuscript contains writing from possibly a number of hands, and may have even been partially a letter written by a scribe or transcribed by a scribe for a response, as is the nature of polemics. David Roberts (1796-1824), The Gate of Metwaley, (Cairo). Wikimedia Commons. For illustrative purposes. The manuscript is 7 folios, unbound but sewn into a gathering. There are two (at least) scribal hands, already identified by Mosheh Hillel in “Ginze nistarot,” in Meḳabtsi’el vol. 38 (Ṭevet 5772), 55-88. Hillel also transcribes the manuscript. Where do booksellers go when they retire from the trade? Lawyers become consultants (ditto for doctors) and the academy has been known to accept tradespeople from all walks of life on an adjunct basis. But bookselling is not a popular college course, and the range of industries looking for freelance advice from hardened paper-traders is, so to speak, limited. Furthermore, what sort of job would be fitting for the archetypical bookseller’s personality? No other industry combines intellectual contemplation with the thrill of acquisition on such an integral, daily basis. There are no words to describe how much I love Clement Winston, budget analyst, artist, author, family man, and account keeper. His papers are both informative and delightful–and happily, we have received a few additions that will be added to the collection this year. 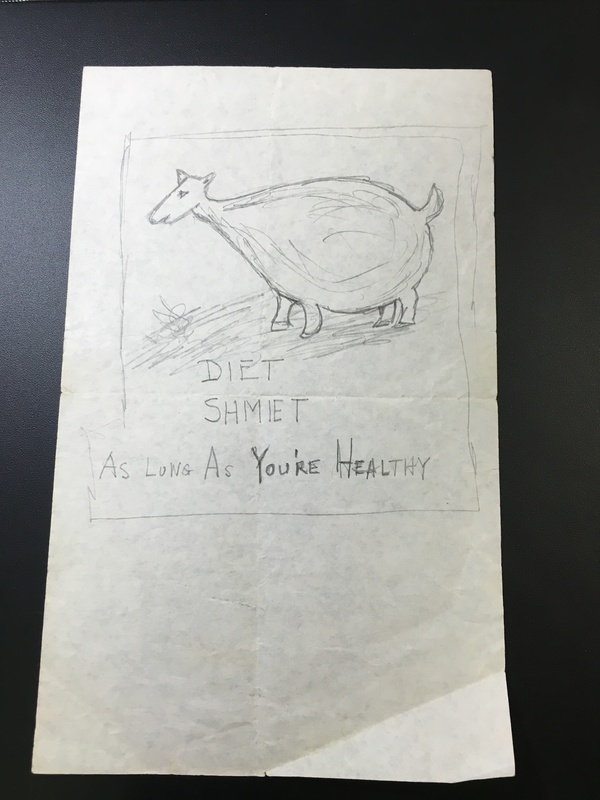 In the meantime, for those of you who may be struggling with your new year’s resolutions as well as any left-over weight gain from the holidays, perhaps you (as I have) will take comfort in Clem’s words of wisdom. Catalogers are no less tempted than anyone else to put off ’til tomorrow what they’d rather not do today. (Sorry, Ben!) But fortunately we have curators to poke through the resulting backlog of curious items, which is how a seventeenth-century German folded quarto sheet purchased for the Penn Libraries in 1959 landed on my desk in 2018. (Thanks, Mitch!) A search on the title—Des Edlen, Ehrnuesten vnd Mannhafften Heinrich Quaden von vnnd zu Eisengartten, Obersten, Gründlicher aussführliche vnd warhaffte Verantwortung vnd Bericht, auff etzliche vnterschiedliche Articul—in the VD17 database of seventeenth-century German imprints quickly brought up an entry and a link to a digitized version of the copy held at the Herzog August Bibliothek in Wolfenbüttel, Germany. And that’s when I realized I was looking at something more interesting than the disjecta membra of a late Renaissance pamphlet: a copy-edited proof of four pages of a late Renaissance pamphlet, printed on a scrap sheet from an entirely different work.